Helambu Trekking, specially designed off the beaten trail that highlights the calm and tranquil area for trekking and the trails are blissfully famous for its outstanding natural beauty, fascinating culture, and favorable climates. 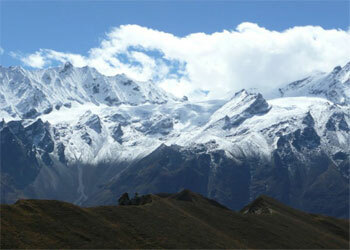 The Helambu Trek landscape is classic Himalayan foothills, with plenty of dramatic rises and plummeting descents. On this grand Helambu trekking adventure, you can discover unchanged central Nepal: trails passing through dense forests and traditional Buddhist villages with the mountain views which are genuinely inspiring. You pass through dramatic ridges, villages inhabited by the Tamang people, lush forests of rhododendron, conifers, oak, and also this trail passes through mountain cattle grazing on rich alpine pastures under the watchful eyes of their herders. Helambu Circuit Trek is easy to get from Kathmandu and trek takes a week, so it is the best trip for those trekkers who do not have the long holiday in Nepal trip. The trail to Helambu climbs on to the Shivapuri ridge from where there are sweeping views of the central Himalayas. This Helambu Circuit Trek will bring us through the Langtang National Park which inhabits a wealth of rare birds, wildlife and unique plants and flowers. During the trek, we will pass through spectacular villages of Kutumsang, Chisopani, and Sermathang with their stunning panoramic views and the village of Melamchi Gaon and Tarkeghyang. The Sherpa village of Tarkeghyang that forms the focus of Helambu is a charming enclave of farmers and yak herders. They are different from Sherpas of Khumbu region and have a unique culture. We go along the south ridge through Sermathang, down to the river at Melamchi, the site of a mega-project to bring drinking water to Kathmandu via a series of tunnels. You will experience the Yolmo culture of high mountains villages, marvel at vistas of lonely high mountains and watch enthralled as the farmers toil in the fields using handmade tools and teams of water buffalo. This trail takes us through the National Park of Shivapuri Watershed and Wildlife Reserve, which inhabits a paradise of flora, including exotic orchids, and a myriad of wildlife and birds. You will trek to villages with spectacular panoramic views including Ganesh Himal Massif, Langtang Himal, Rolwaling Range and distant views of peaks in the Everest region. With the diverse range of bright green valley’s dark rhododendron forests and distant horizons of snowy mountains, Helambu is the ideal for short trek. Helambu region lies to the north of Kathmandu and offers the nearest experience of Sherpa culture without having to go to the Everest region.this itinerary is comfortable and enjoyable trip for the trekkers who wish to experience adventure and closeness to the Himalayan trail without going at high altitude. Some of the main attractions of this region include: beautiful gompas enshrining statues of Guru Rinpoche, Sakyamuni, and Chenresig (Avalokitesvara). Accommodation: Hotel in Kathmandu & Teahouse during the trek. We will meet you at Kathmandu Tribhuvan International Airport and transfer to your hotel. When you have had your time to settle in and freshen up after your long fight, you will be invited to visit our office for a briefing about your program. You will have a meeting with your trekking guide and discuss the equipment needed for the trekking, and we will process for the trekking permits. If you arrive at night, we will have the same discussion in the next day morning after your breakfast. Drive for about an hour from Kathmandu to Sundarijal (1350m) where there is a massive water project which supplies most of the drinking water to Kathmandu Valley. The unpaved road turns into a trail near a small hydroelectric plant and starts up concrete steps alongside the water pipe. Beyond Sundarijal the trail climbs continuously through forests to a medieval-looking reservoir, dam and waterworks. Crossing the dam, the path leaves the water supply system and rises steeply to a road to the top of the Shivapuri ridge and wildlife reserve. The trail now continues up the hill through the forest to meet the Mulkharka Villages with the inhabitants of Tamang people. The trail continues to drop from Chisopani on a good sometimes level crossing meadows and fields. There are excellent mountain views as you leave the full track and drop down into the valley on a muddy zigzagging path. The trail heads north out of Pathi Bhanjyang (1770m), the Brahman and Chhetri village and a gentle ascent to a small white chorten at the Sherpa village of Thakuni Bhanjyang. Make a very steep incline on a switch back to Chipling and 200m climb on a stone staircase to the top of the Jhogin Danda ridge (2470m). You’ll have good views of the peaks as you drop down through rhododendron forest on the far side of the pass. We will Continue along the forested ridge and descends to a large chorten overlooking the Tamang village of Gul Bhanjyang. The trail climbs the ridge from Gul Bhanjyang to another pass at 2620m. The trail steadily rises through the prickly-leaved oak forest with excellent views of the mountains and the Helambu valley. 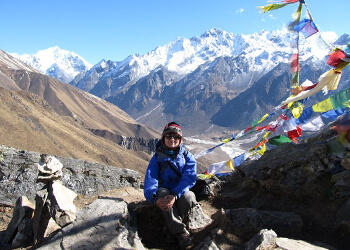 The trek proceeds due north up the Yurin Danda ridge and affords views of the peaks above Langtang and the Gosaikunda peaks. The trail climbs above Kutumsang on a steep, eroded trail, mostly through fir and rhododendron forests where there are only a few shepherds’ huts. The trail descends to Magen Goth and continues to climb, steeply at first, and then more gradually, the trail makes some ups and downs passing through forests, across flower-strewn meadows and crossing streams. A steep path raises above the village to a fluttering white prayer flag on a mind swept hilltop, offering a perfect panorama of the Langtang Himalaya. We arrived at Tharepati Rise early for excellent close-up views of Gosaikunda and surrounding high mountains. Overnight stay at the lodge. The path passes pine and rhododendron forest rich with bird life along with excellent views down into the Helambu valley. The elevation gives you a marvelous mountain view of the Jugal Himal and Numbur in the Solu Khumbu. After crossing the bridge, the trail climbs steeply up to the sprawling valley of Nakote (1980m). Then the path goes gently up to beautiful Sherpa village Tarkeghyang (ghyang means monastery) passing through Sherpa old settlements and most prominent monasteries. Narrow cobbled lanes and tightly packed houses here resemble the high altitude villages of Mustang and Dolpo which are worth viewing. Tarkeghyang boasts an 18th century Gompa with a considerable brass prayer wheel. Today the trail is quite easy through the flat land with beautiful forests. The path leads us to cross small forest with the view of the charming village of Helambu region. The trail makes a sweep around the wide valley end between Parachin and Sherpa village of Gangyul of Khumbu region. Sermathang is another pretty Sherpa village where you can visit many ancient monasteries and view of Jugal Himal range. In the bright day, the villages provide good views of Ganesh Himal, Langtang, Gosaikunda and Rolwaling, Even Mt. Everest also in the distance. Today the trails gradually descend all the way to Melamchi Pul Bazaar through meadows and cultivated fields. On the way, you come across several old villages. With the spectacular Mountain View, you will get to interact with local and friendly people. From here take a drive of around 3-4 hrs to the Kathmandu valley. Enjoy the panoramic views all the way, enjoying the fresh air and forested road. Drive back to Kathmandu by bus or private vehicle; join Nepali cultural dinner in the evening overnight in Kathmandu hotel. Tea house/Lodge during the trek.